Important Notice: Until further notice, due to aging infrastructure Syringa campground and day use area is under a Boil Water Advisory. The tap water should not be used for drinking, making infant formula, juices, cooking, making ice, washing fruits, vegetables or brushing teeth. For these purposes, boiled or treated or bottled water should be used. Alternatively, boiling water destroys all disease causing microorganisms (pathogens) and is considered safe to drink after cooling. Water should be brought to a rapid rolling boil for 1 minute prior to consuming. Campers may take showers with untreated water – please direct younger children not to drink the shower water. We apologize for the inconvenience. Syringa will open April 26th to Sept 29 for the 2019 camping season. 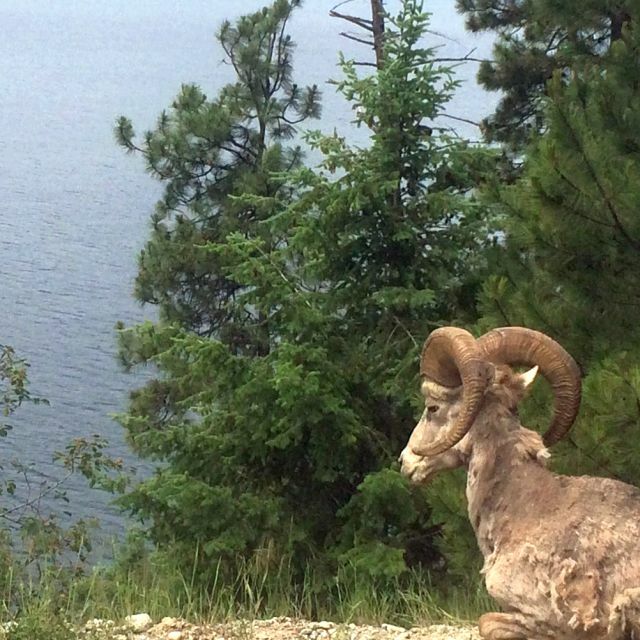 Bighorn Campground now has electrically serviced RV sites #62 – 70 with 30 & 50 amp on sites 62 to 68 and 30 amp to 69 & 70. All electrical sites may be reserved through Discover Camping, a $7 surcharge applies. The popular Group Site is back! The Sturgeon Point Site is located in the Boat Launch area can comfortably fit up to 6 trailers with trucks and 6 tents up on the second level. Reservations can be made up to 12 months in advance by clicking through the link above to the Discover Camping Reservation system. If you have any questions or concerns please contact the RAP Park Contracting directly at 250.825.0117. 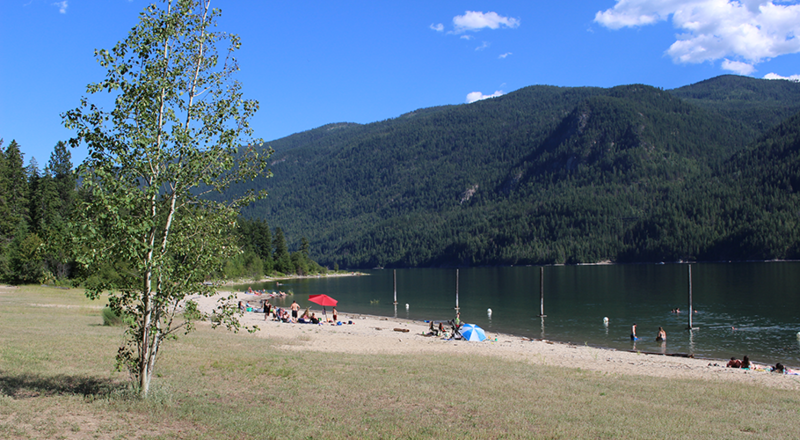 Until then, Syringa Park is a lovely place for a long, relaxing beach walk. Lake Reservoir have made the park a long-time popular destination and offer a comfortable base camp for the family to pursue a variety of recreational pursuits including fishing, boating and swimming. 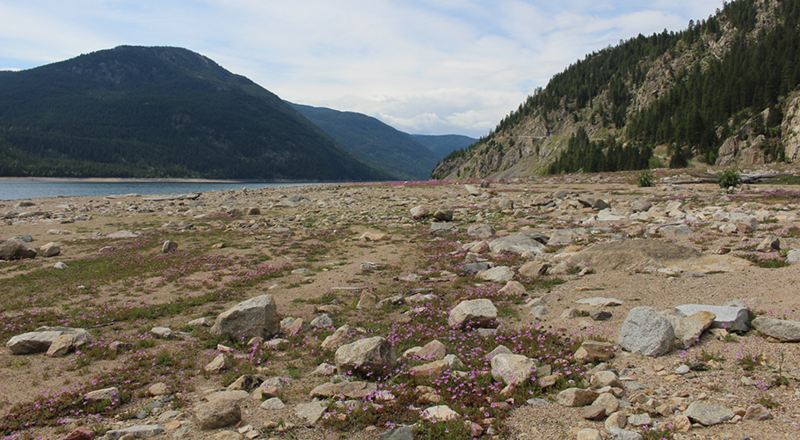 The park protects not only provincially significant interior Douglas-fir forests but also preserves one of the few remaining examples of grassland ecosystems in the Kootenays. A variety of wildlife are at home in the park including, elk, deer and a herd of rocky mountain bighorn sheep that can often be observed grazing on the many rock bluffs. Opportunities for nature appreciation occur all year making this park a destination in every season. 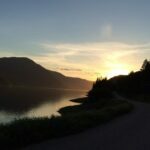 The Castlegar & District Chamber of Commerce and Visitor Centre – 1995 6th Ave. Castlegar 250.365.6313 or toll free: 1.888.365.6313.
the facility are four tennis courts, soccer/football field, ball diamond and skate boarding park. 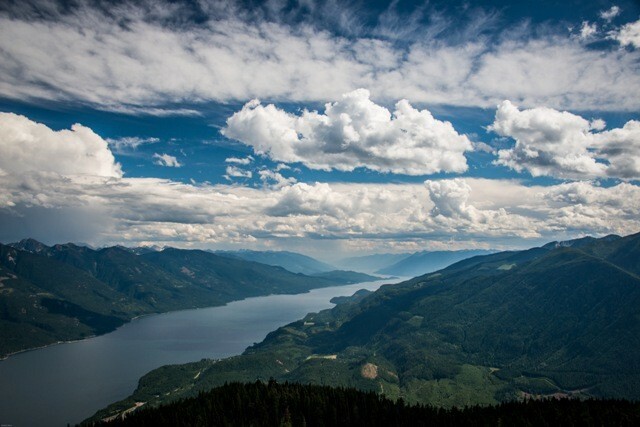 a bird’s- eye view of the Kootenay River. Canadian Pacific Railway Museum – One of the best preserved CPR station houses the local museum is filled with antique treasures, memorabilia, a real caboose, gift shop and news archives. Be sure to allow enough time to stroll the beautiful grounds. 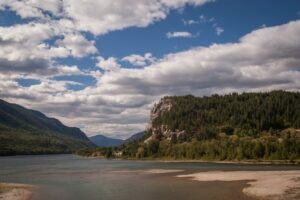 Kootenay Art Gallery – Explore a diverse collection of exhibits and works by local and international artists. The grounds are well maintained and feature a working sundial. artifacts to showcase the pioneer’s spirit. Other local attractions worth a visit – The Hugh Keenleyside Dam, the Mir Centre for Peace, the Verigin Memorial Park and a busy summer schedule of Festivals, Farmers Markets and Fairs. flowers with bright yellow stamens that emit a powerful, pleasing fragrance. First established in 1968 to provide recreational opportunities, the park was increased to its present size in 1995 to protect a provincially significant ecosystem. your presence known. When sightings occur, take a detour and leave the area immediately. – To avoid potential problems with bears, lock your food in your vehicle at night. Be sure to use the garbage containers provided and maintain a clean campsite. – Be considerate of Wildlife… use binoculars to view from a distance rather than approaching them to closely. 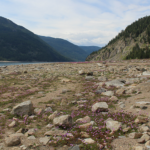 – Be considerate of Habitat… Plants are important habitat for wildlife, please do not damage, pick, or trample and please stay on the designated trails. – Please control pets by keeping dogs on a leash and under voice control at all times in order to protect wildlife and preserve their habitat. overnight and boats are sometimes left in the water or beached but the shoreline offers no protection against weather changes. Water skiing, wake boarding, fishing and general cruising are all enjoyed on the lower Arrow Lake with access from the Park. Scotties Marina is nearby should you need boat supplies, camping supplies or fuel. The peak months for canoeing and kayaking are July and August when the water is high. Shoreline canoeing/kayaking is recommended as lake weather can change rapidly. Easy access is provided at both the boat launch and day-use/picnic area. Lower Arrow Lake can provide excellent fishing for rainbow or bull trout, and kokanee salmon. Anyone fishing or angling in British Columbia must have an appropriate license which can be purchased at Scotties Marina just down the road from the Park. swimming opportunities. There are NO LIFEGUARDS on duty at anytime. 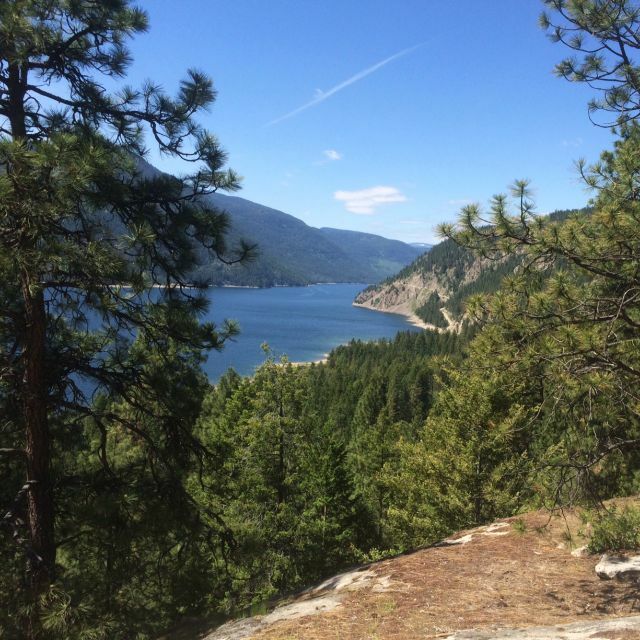 Due to a prevailing north wind on Lower Arrow Lake, there are good windsurfing and kite boarding opportunities. Broadwater Road is paved from Castlegar to Syringa Park and is ideal for road riding. trails’; this means cyclists should be confident riding on rough trails. hoots and hollers alert wildlife of your presence and will likely cause them to move on. Bicycle helmets are mandatory in British Columbia. excursion from the hectic pace of everyday life. 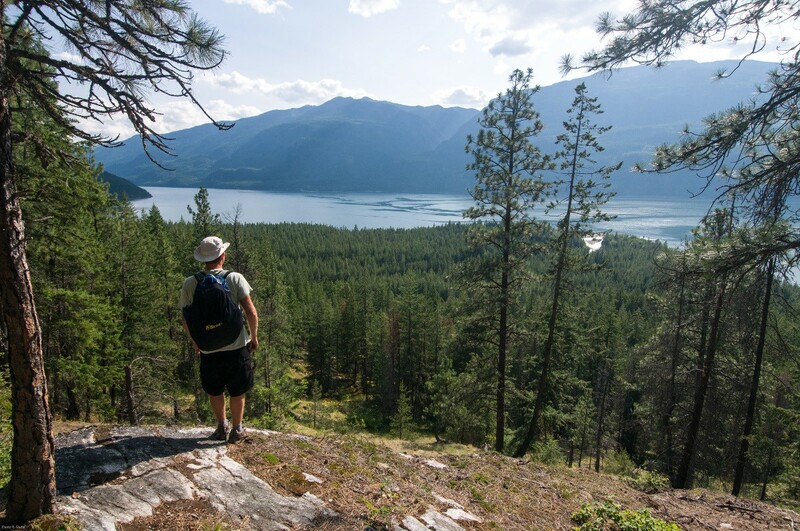 Only minutes from downtown Castlegar, you are instantly transported to a golfer’s paradise. 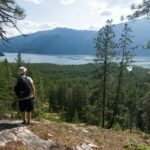 with spectacular views of the Selkirk and Monashee Mountains. Known for its large manicured greens and contoured fairways, this extremely well maintained, great walker’s course offers an enjoyable experience for all golfers. There are low impact walking trails that connect the campground to the day use area with approx. 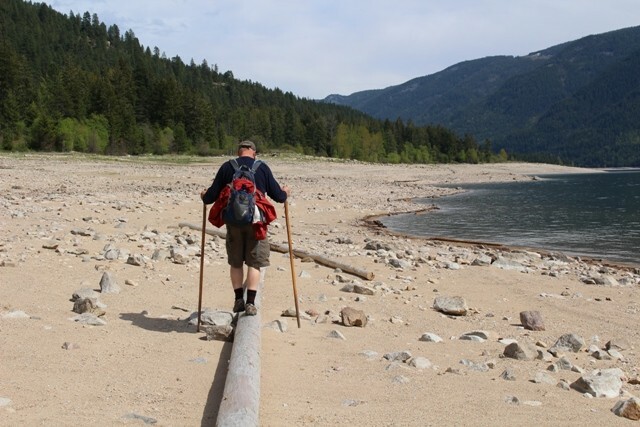 8 kms of more difficult hiking trails accessible across the main access road. 2 km of trail links the picnic area with the campground. Please check with our Camp Hosts or Guest Services staff for information on the other well traveled trails in the area. For your own safety and the preservation of the park, obey posted signs and keep to designated trails. Short cutting trails destroys plant life and soil structure. Nearby on the Castlegar Bluffs. 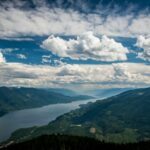 Check out the Robson Rock Climbing Festival in June. 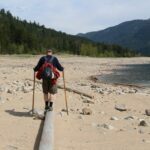 Group Camping at Sturgeon Point – Max. 50 people Youth Group $50.00 base rate plus $1.00 per head to a max of $100 per night. Adult Group – $120 base rate, plus $5 per adult, per night, $1 per youth under 15 years per night. A full listing of our 71 reservable campsites can be viewed at: www.discovercamping.ca or by Phone: 1-800-689-9025. Bookings can only be made up to 90 days in advance of arrival. Our non-reservable sites are available on a first come, first served basis and cannot be held for guests that have not yet arrived to the park. c. Recreational vehicle (RV), e.g., motor home, camperized truck/van.- a RV with a legally towed motor vehicle; or – Motor vehicle or RV towing a trailer not designed as an accommodation for camping, e.g. utility/cargo, or boat trailer. A camping party may also include a tent or tents, if suitably accommodated on the campsite pad. A camping party may be allowed a 2nd motor vehicle not designed as an accommodation for camping on the campsite for an additional ½ of the camping fee. Campfires are allowed and campfire rings are provided at each campsite. Firewood can be purchased in the park for $7 per bundle. You may bring your own wood but it is not recommended that firewood be transported from area to area due to the potential to spread invasive insects and disease that can be contained in the bark. Limited burning hours or campfire bans may be implemented in the event of a high fire hazard over the hot summer months. To preserve vegetation and ground cover, please don’t gather firewood from the area around your campsite or elsewhere in the park (this is a ticketable offence under the Park Act). Dead wood is an important habitat element for many plants and animals and it adds organic matter to the soil. Cold well water is available for cooking and drinking. Four water taps are randomly located in the campground, with two each at both the day-use/picnic area and boat launch. Taps are shut off during the off-season. 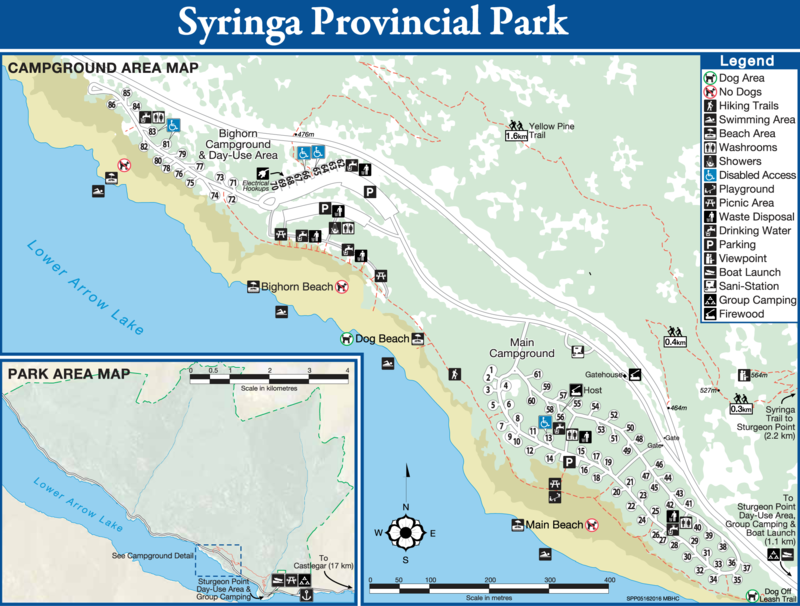 Syringa has three day-use/picnic areas. As the park is on a reservoir, the water does fluctuate from spring through fall. The water level is low in May, rises in June and is at full pond for July, August and September. The upper portion of the beach is sand with the lower portion rocky, which is mostly exposed at low water. The main picnic area is located NW of the campground along the lake. The beach is 250 metres long with 30 picnic tables located on a raised partially shaded grassy terrace in front of the beach. A new toilet/change house with showers, 2 pit toilets and water taps are available for day users. This day-use/picnic area is the largest in the park, with a paved parking lot. 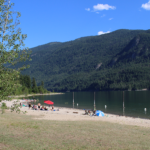 As indicated by its name Boat Launch day-use/picnic area with its 150 metre beach, 6 picnic tables and 4 pit toilets can be found at the boat launch in the south end of the park just past the park entrance.There are fire rings in this area. 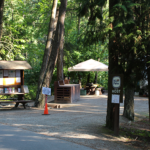 Camping day-use/picnic area is located in front of the campground and is primarily used by campers. The beach is 50 metres long and has 7 tables. The campground washrooms and water taps are nearby. This day-use/picnic area has the only adventure playground in the park. 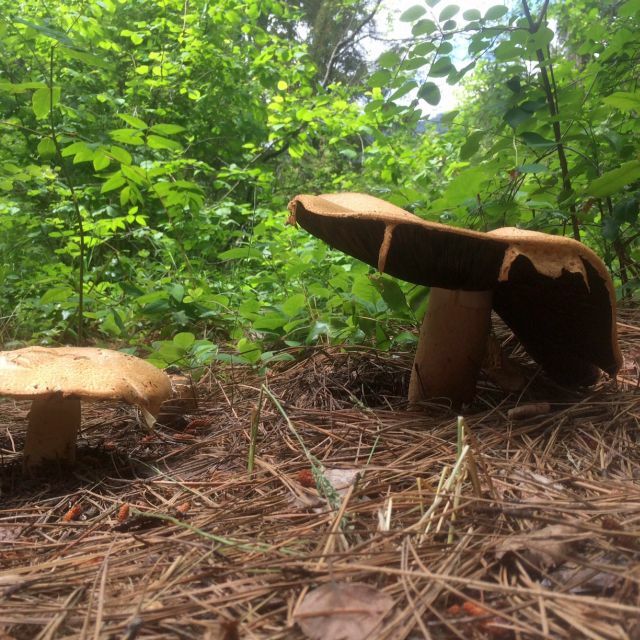 Dogs accompanied by responsible owners are welcome at Syringa Creek Park. However, we ask that you help us protect our wildlife and ensure the park is a safe and pleasant environment for all visitors by adhering to the following Canine Code of Conduct. 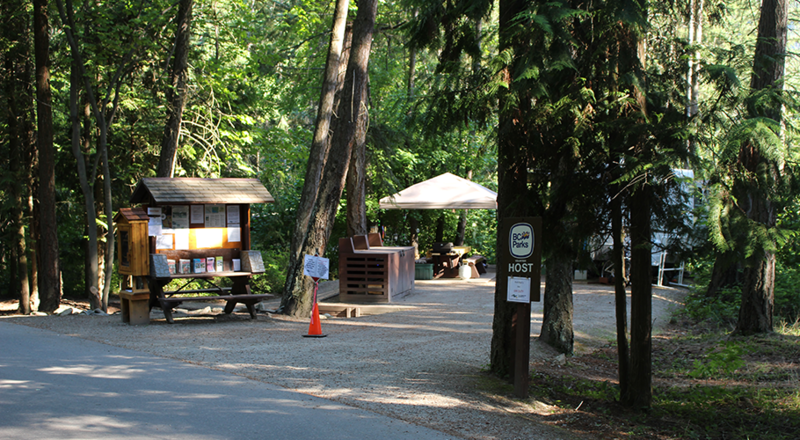 A sani-station/dump is available in the park and is located just past the entrance into the camping area. There is a $5.00 fee for using the dump which helps the park pay for the disposal.